Today the Prime Minister along with other Ministers, the Mayor Phil Goff and Deputy Mayor Bill Cashmore attended a ceremony in Drury today marking a new special funding unit to bring forward critical infrastructure to enable faster developments of housing in the Southern Auckland Future Urban Zone area. 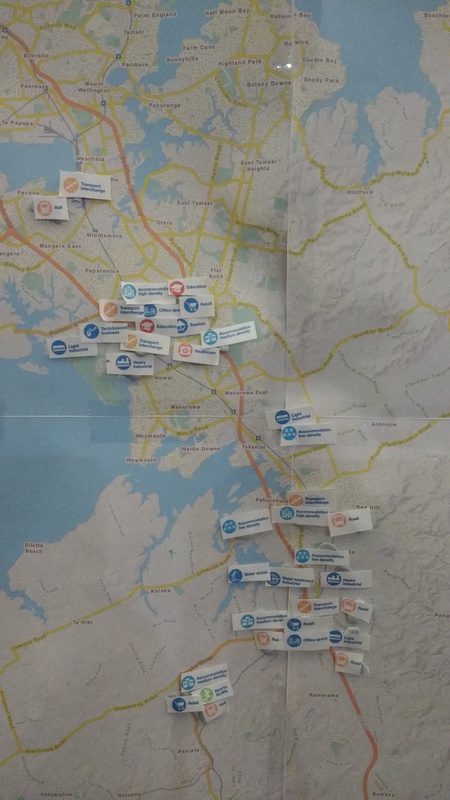 The Southern FUZ is the yellow on the Unitary Plan maps starting from the edge of Papakura and following the Great South Road, rail line and part of the Southern Motorway to Pukekohe. The Government will co-invest up to $600 million alongside local councils and private investors in network infrastructure for big new housing developments through a re-purposed ultra-fast broadband company, Finance Minister Steven Joyce and Local Government Minister Anne Tolley say. “Crown Fibre Holdings will be re-named Crown Infrastructure Partners, and bring the investment skills and experience gained through the Government’s world-leading ultra-fast broadband rollout to the job of attracting private investment in roading and water infrastructure that open up big new tracts of land for more housing development,” Mr Joyce says. “This innovative new funding method will be made available to cash-strapped councils who are struggling to fund new long-term infrastructure from their own balance sheets,” Mrs Tolley says. Two of the earliest projects to be assessed by Crown Infrastructure Partners for investment will be the Auckland North and Auckland South projects previously submitted by Auckland Council as requiring investment outside the Council’s own balance sheet. “These two large projects can provide an additional 5,500 homes in Wainui to the north of Auckland, and 17,800 homes across Pukekohe, Paerata and Drury to the south of the city,” Mrs Tolley says. Mr Joyce says the Government is prepared to be an investor alongside the private sector and take up some of the early uptake risk. Mr Joyce says it forms part of our comprehensive programme for lifting housing supply to meet the needs of a confident growing country. “Crown Infrastructure Partners is the logical next step in infrastructure funding following the Government’s Housing Infrastructure Fund which will deliver 60,000 houses across our fastest growing population centres over the next ten years. What is Crown Infrastructure Partners? CIP is a Crown company (formerly Crown Fibre Holdings) that is being tasked with designing and implementing new commercial models to attract co-investment from the private or other sectors and achieve the Government’s objectives for the efficient deployment of water and roading infrastructure to support the timely increase of housing supply. The aim is to increase the total investment in local arterial roading and network water projects needed to make more housing development possible by tapping private sources of capital. Why repurpose CFH as CIP? A number of corporate structures were identified during the review phase. Establishing a Special Purposes Vehicle (SPV) that investors, councils and government have confidence in requires a high level of commercial and financial expertise. This expertise currently exists which CFH and since the Ultra-Fast Broadband programme is nearing completion (Phase 1 is 75 per cent complete), that work will start to wind down which means there is capacity to start this new project. In addition, repurposing an entity like CFH is significantly cheaper and more efficient than establishing a new entity. What is the aim of CIP? CIP will work to speed up housing developments. The aim is that by introducing different sources of capital, it will allow the infrastructure required for this growth to be brought forward earlier than would be possible if it was funded entirely from Council balance sheets. Some high growth Councils in New Zealand are constrained in their ability to take on further debt to invest in infrastructure. Many of these high-growth Councils are near their borrowing limits, and so cannot finance the infrastructure investments needed to keep up with demand. This limits their ability to open up the supply of land for housing construction, which in turn feeds into higher house prices. How will CIP speed up housing developments? CIP will look at how Crown investment through an SPV might be designed to bring forward the provision of infrastructure, particularly in these high-growth areas, to enable housing supply to be brought forward. The long-term goal is to change the market for infrastructure provision in New Zealand. CIP will fix this problem by establishing SPVs. The role of the SPVs will be to invest in roading and water infrastructure assets in the place of Councils. In return the SPV will receive a stream of revenues from developers or the households that use the infrastructure. In the case of developers, that revenue may be in the form of a one-off payment. In the case of households, the cost of the infrastructure will be recouped over the life of the asset through a targeted rate or volumetric charging. The advantage of the SPV model is that it allows land owners and developers to bring forward the infrastructure projects that would otherwise not have started for a number of years due to councils’ financial constraints. This is because a key feature of a SPV is that the debt it takes on is reflected on the SPV’s balance sheet, not the council’s. As such it does not affect councils’ debt limits, and frees up the local infrastructure funding bottleneck. Why look for private capital instead of traditional rates funding? Rates are tax levied against property owners to pay for the goods and services they receive from their local council. As such there is affordability and equity considerations that councils have to take into account when setting rates. For instance, it is not equitable to ask ratepayers to fully pay for long-term infrastructure today when it will be used by multiple generations. Most councils overcome this by accessing long-term debt, spreading the costs over the life of the asset. However, some Councils’ ability to do this is constrained by their debt limits and limited borrowing capacity. By accessing private capital, councils sidestep this financial constraint and provide the necessary infrastructure their growing communities need. Is this just a tool for Auckland to use? No. This model will be scalable and used in other fast-growing centres across New Zealand. However, as most population growth pressures are concentrated in Auckland, the first SPV being explored will be within in New Zealand’s biggest city. Other Councils will be eligible to apply to set up SPVs provided their projects meet certain criteria. What are the SPV criteria? CIP will develop these criteria over the next few months, but at a high level projects must show an ability to generate sufficient revenue to cover their own costs over time, including the cost of capital in most cases. They must also include an exit pathway to allow the Crown to recoup its capital within a reasonable time period. Projects should include a mechanism through which external providers of capital can invest in infrastructure. What investment opportunities are there in Auckland for CIP? As part of the Housing Infrastructure Fund (HIF), two proposals were put forward by Auckland Council for an additional investment in roading and water infrastructure so as to accelerate the pace of house building in Auckland. The North project encompasses the Wainui area, and the South project encompasses the areas of Paerata, Pukekohe, Drury West and Drury South. These projects did not receive HIF funding as they did not meet the specific criteria set by the Government, such as falling within the current 10-year planning period, and they couldn’t be funded from within the Council’s balance sheet using HIF funding. The characteristics of these projects make them highly suitable to fund roading and water infrastructure through and Special Purposes Vehicle (SPV). Should projects proceed to completion, it is expected that combined they will open up sufficient land for the construction of 23,300 additional houses, taking total housing capacity in these areas to 28,300. The total infrastructure investment being sought is $588 million. How big is the opportunity to the North of Auckland? New urban areas in the North, including Silverdale, Wainui and Dairy Flat have been identified by Auckland Council as areas where greenfield housing development can be significantly expanded over the next 30 years, provided the necessary infrastructure is in place to support the expansion. What infrastructure investments are needed in the North? The North project focuses on Wainui, where the existing infrastructure can only support the construction of 2,000 new houses in the area zoned for residential use in the Auckland Unitary Plan. It is estimated that an infrastructure investment of $201 million ($149 million for transport; $52 million for water) could sufficiently increase infrastructure capacity to service up to another 5,500 houses in Wainui. What water infrastructure developments would this cover in the North? What transport infrastructure developments would this cover in the North? What is the opportunity in the South? 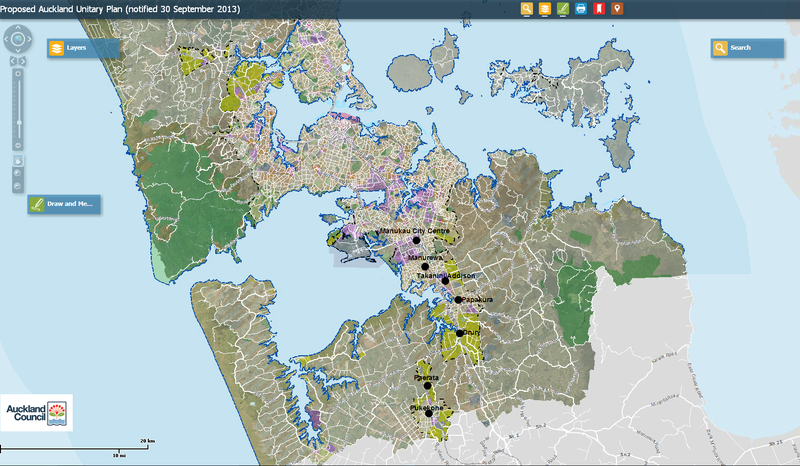 The greatest opportunity to create new urban areas in Auckland is to the South of the city, where around 5,300 hectares of land has been identified for urban development. The areas of Paerata, Pukekohe, Drury West and Drury South offer the greatest opportunity to fast track the supply of housing as they are the most ready to develop. What infrastructure investments are needed in the South? Although areas in the South have significant potential to expand greenfield housing capacity in Auckland, only 3,000 additional houses can be supported by the existing water and roading infrastructure. It is estimated that an infrastructure investment of $387 million ($215 million for transport; $172 million for water) could increase the supply of new houses by 17,800 across Paerata, Pukekohe, Drury West and Drury South. What water infrastructure developments would this cover in the South? What transport infrastructure developments would this cover in the South? Why is Drury South being considered for the first SPV? Drury South is one of the four areas (including Drury West, Paerata and Pukekohe) situated to the South of Auckland that has been identified as having the greatest opportunity to create new urban areas. Out of the four areas it is the most developed and is in near ready-to-go status, having already obtained planning permission, with the design and consenting expected to be complete in 2017. Should major civil works commence in October 2017 it is expected the project will be ready for the first occupants in 2019. What will be built in Drury South? The Drury South project being developed by Stevensons Group is an integrated development that will provide for more than 700 houses as well as an 180Ha business and industrial development adjacent to the Stevenson Drury Quarry. The business park will facilitate 15,400 jobs across the Auckland region, 5,000 of which will occur within the business park, which is expected to contribute $2.3 billion to the regional economy every year. What transport infrastructure is needed in Drury? To facilitate and accelerate development within the southern sector of the city, Auckland Council and NZTA are investigating the southern section of the Mill Road Corridor, a Primary Arterial Road/Expressway that will link Mill Road in Manukau with Pukekohe. The Drury South project proposes that a Mill Road Arterial be constructed that will intersect and connect to SH1 within the bounds of the Drury South Development Area and Great South Road in the West. This interconnection via the spine road will provide important network resilience to both the Mill Road Arterial and SH1. What water infrastructure investment is needed in Drury South? The project requires new wastewater and freshwater connections. This includes a 4.5km trunk sewer between the project and Hingaia pump station north of Drury, and a new connection to the Waikato water pipeline in Drury. This infrastructure will be designed to integrate with other developments in the area and could service in excess of 10,000 households. Civil works to deliver the land ready for development will total $300 million, of which an estimated $68 million in road and waste infrastructure will be assessed for CIP funding. Good to see with the South and timely as well. Yes the Mill Road – southern corridor is needed (compared to the northern corridor) as it services the Drury heavy industrial complex one of the big four in South Auckland and one of five in Auckland as a whole. The two new stations are very timely and will combine well with the new battery-powered Electric Trains on their way to service Pukekohe to either Manukau or Britomart on the Southern Line. With the two stations funded it means the Pukekohe Electrification is no longer $118m but $58m as the $118m had included the two stations as well. Of course there are more finer financial intricacies to a State Infrastructure Bank and how much of a percentage it should bank roll non regional transport infrastructure (heavy rail and State Highways) and so on but hopefully by penning down the basics here something might get rolling. Because the current method through Council debt and Development Contributions is simply not working while terms of finance are very favourable for Budget Deficits to fund the State Infrastructure Bank. Auckland Mayor Phil Goff and Deputy Mayor Bill Cashmore have welcomed the Government’s announcement today of a new infrastructure investment vehicle. “Funding provided through a Crown Company, Crown Infrastructure Partners, will enable Auckland to speed up the construction of thousands of new homes in our city,” Phil Goff said. “Earlier this year we took to Government the concept of a Special Purpose Vehicle to fund infrastructure in a way that recognises constraints on further Council borrowing. “Under this vehicle we have lodged proposals with Government that would enable us to bring forward construction of around 23,300 new homes in South and North Auckland, much earlier than would otherwise be possible. “The announcement of the SPV was made in Drury today because this area will be the likely first recipient of initial funding with 700 homes planned. “The initial investment of $387 million in transport and water infrastructure in Drury South and West, Paerata and Pukekohe will enable the construction of 17,800 dwellings much earlier than would otherwise be the case. “A further major development will be around Wainui in north Auckland with $201 million in infrastructure funding required for an additional 5,500 dwellings. “The new investment vehicle will provide capital from Government and the private sector which will not be debt on Council’s books. It will be funded through development contributions and targeted rates within the new housing developments. “Auckland is growing by 45,000 new residents a year and requires unprecedented levels of infrastructure growth to keep up with demand. “Increasing the supply of housing is a critical part of overcoming our housing shortage and slowing price rises caused by demand exceeding supply of housing,” Phil Goff said. “The new Unitary Plan ensures there is adequate land, green and brownfield, to meet demand, but infrastructure servicing that land is necessary for homes actually to be built. “SPVs are another tool in our toolbox to enable us to lift the scale and pace of new housing development,” the Mayor said. If I had just one complaint it would be this: WHAT TOOK SO LONG? I wonder if the timing of the announcement has something to do with the election year and all the funding will go into a safe national area. I am happy to get this extra funding but don’t we need a third rail line as well and southern airport route? Most likely to do with the election. However, no votes in it really so it seems more legacy stuff. THAT SAID, while 9 years late the two new stations are finally on their way as well as the new electric trains. For that I am thankful to Deputy Mayor Bill Cashmore and former Deputy Mayor Councillor Penny Hulse for getting the ground work sorted that led to yesterday.